Hey guys, Matthew Weiss here — weiss-sound.com, theproaudiofiles.com, and mixthru.co. I’ve got a vocal here. It is from a late 90’s East Coast style rap. It features Armaggedon from Terror Squad. It’s also featured in my latest Mixthru, so if you want to see the record from start to finish how I mix it, you can pop on over there and check it out. What I want to show you right now is a really cool technique that you can take if you’re doing any style of Hip Hop music, or really any style of music. I just think this is something you can glean a lot from, but the idea here is thinking back on how vocals were recorded — or how everything was really recorded twenty years ago, there’s a lot more componentry involved. Right now, when you’re hearing my voice, all you’re hearing is mic, preamp, converters, boom, it’s in, and I consider this mic to be a pretty stylized mic and my preamp is an Avalon M5, which is a pretty colored preamp, so you know, you’re hearing a lot of the flavor of the componentry here, and it still sounds fairly clean. Now in the older days, you would probably have the vocal mic going into the preamp, going into a compressor, maybe even going through the channel EQ, hitting the channel, getting laid back to tape, or getting laid back to some kind of an early digital conversion system, and then for the mixing process, it would go through another set of componentry where it was coming back off the repro head, or it was coming out of the converters of the digital sampler, or whatever it may be, and then going to the console, and then from the console you’d have your processing equipment, and even just clicking an EQ in would change the tone of your source. So there’s a lot more componentry going on, and at every step of the way you’re getting something called saturation, or THD, which stands for Total Harmonic Distortion, which is just sort of a technical way of saying color. It’s adding flavor at every step. Because we’re recording with such clean signal paths, we’re not getting as much of that flavor these days, so this technique is not something I developed, I don’t believe, but I don’t know anyone else who’s taught it, so the idea here is to take your vocal and to do saturation and little bits of distortion and adding color before even beginning to really treat the vocal, and what’s cool about this is you don’t have to do it in any one specific way. I chose a couple of pieces that I felt would work, but you know, the sky is the limit. It’s a coloring box, you can choose any crayons you want. So let’s listen to this vocal and then I’m going to walk through my processing and choices, and hopefully you’ll be able to take the ideas here and create your own so that you can have a sound design or style that is uniquely yours when you approach anything this way. The one thing that I should say is that this vocal already sounds like it’s pretty saturated. There’s some good amount of high end roll off, and there’s a little bit of this hairy quality to it, this sort of crackly, distorty quality that shows that it was recorded with the gain on the preamp pretty high. So we already have a little bit of that going. This is not as clean as most, but we’re going to go further with it. So the first thing I’m going to do is I’m going to pull up this iZotope Vintage Tape Machine, and I’ve set the drive to five, I’ve set the bias pretty much in the middle. I’m using the 15 inches per second tape machine, which is going to be a less transparent choice than 30 inches per second. I’ve got my third harmonics cranked up a little bit. It’s right in the middle here. Then there’s this low emphasis, high emphasis, which reflects the biasing of the tape machine. Anyway, yadda, yadda, yadda, let’s hear the before and after. So you can hear that the mid-range comes forward a little bit, you can hear the overall frequency curve change a little, you can hear that there’s a certain extra glowiness that starts to show up, and a certain color that it’s sort of hard to put exact words on that shows up. Now what I’m going to do is even a little bit more distortion. I’m going to use the stock Digi Lo-Fi, which is a very aggressive distortion plug-in. It really only takes a little bit to get something going here, and all I’ve done is put the saturation here at 0.2. That’s it. That all I need and that’s going to change the signal pretty dramatically. So here we go, before and after. And you can hear that a little bit more hair starts to show up. It starts to get a little fuzzy, just a touch. The low mids starts to feel like it thickens up a little bit, and the high end has a very tiny pinch of roll off. Now you might say that’s fairly subtle, but here’s what happens if I take both of them off and then bring them both in. And there you’re going to hear a significantly different quality. It’s much “warmer,” it’s thicker, it’s fuzzier, it’s got a lot more character going, and so I think that this is stepping in the right direction. Now the other part of this equation is being wary of how to then treat the vocal, and I like to do this right up front, because all of these stages of saturation are going to change the dynamic and change the tone of the sound. So it doesn’t really behoove us to start EQing first and then start adding our color and our saturation, we sort of need to do that reactively, and that’s how it would’ve been done had we been mixing 20 years ago, because the feed would come in line to the console, and then we would begin to do whatever it is that we’re doing. So one of the aspects of this particular setup that I’m using is that I’ve taken an already dark vocal and I’ve made it even darker. So most of this EQing that I’m doing here is pretty utilitarian. I’m doing some high pass and taking out a little bit of the front of face tone around 1.6kHz, that sort of telephonic tone that I don’t like, but what’s interesting to note is that I have a top end shelf, and that’s fairly common. I’m usually adding a little bit of top end to vocals at some point, but usually it’s closer to three or four dB. Here I’m adding eight and a half decibels of top end, which seems overkill, but you’ve got to remember, this is an already dark sounding vocal that’s being rolled off further, so it actually doesn’t sound crazy. Alright, here we go, before and after. Now, I think the contrast makes it very apparent, you know, all of that top end that we’ve added, but if we just listen to it without hearing the before, you hear that it’s not really obscenely bright. It just sounds like a bright vocal. That’s all. It doesn’t sound like, “Oh my god, there’s so much treble going on,” and when we hear it in the mix, it doesn’t sound like that much treble at all. Like, if anything, maybe the f’s and t’s and esses kind of jump a little bit much, so I can always just turn up the de-esser a little bit more. Then the last thing I’m doing is just adding some utilitarian compression. I’m using a FET style compressor, so not something that’s totally dissimilar to an 1176, and it’s just to — this is something that I would be doing to the vocals regardless. But I don’t have to do much, actually, because the saturation has already created a compression curve on the vocals, and Geddy’s vocal is already consistently delivered. 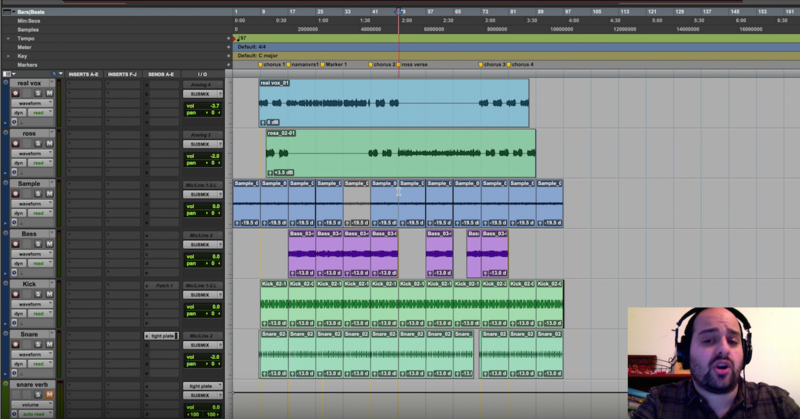 So I don’t really need to go crazy with the compression to get the vocal to really lock in. So here’s a quick before and after. Alright guys, so please like and subscribe to this video and channel respectively, and if you want to see how I develop this mix from start to finish, you can go over to mixthru.co, and I hope that you learn something. I hope that you take this technique and you find your own way to do it, find the amount of distortion that you like, find the types of colors that you like, and experiment with it, and really create your own thing, because you know, mixing is a technical process in a lot of respects, and it’s a stressful process in a lot of respects, but we shouldn’t forget that it should also be fun and it should also be personal, and it should also be our own thing and enjoyable, and this is just one of those places where we get to be creative, and we get to have a little bit of fun with what we’re doing.